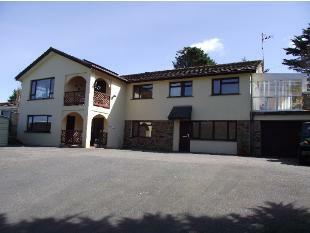 Westmount Haven is a 5 bedroom, 5 en-suite bathroom, luxury, executive, detached house situated in beautiful, green countryside just outside Perranporth in Perrancoombe, Cornwall. Westmount Haven is a split level property - with the living accommodation and 4 bedrooms / bathrooms being on the first floor. This gives excellent views of the countryside - you can see foxes playing in the distant fields, horses grazing - a very scenic / picturesque location. On the first floor, there is a fabulous fitted kitchen, well equipped utility room, dining room opening to large sitting room, 4 bedrooms, 3 en-suites, large family bathroom, 2 conservatories, balcony and on the ground floor is a self contained annexe with bedroom, galley kitchen, lounge / diner, shower room - perfect for an extended family. 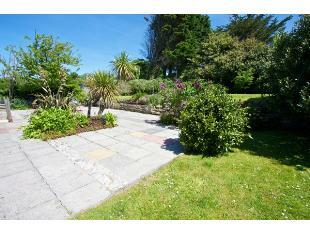 Set in a 3/4 acre, well established garden. Parking. Furnished and equipped to the highest standard and includes central heating, full double glazing, Sky TV, DVD players, TVs in lounge and bedrooms, internet access, CD players, American style washer, American tumble dryer, dishwasher, American fridge/freezer, halogen hob, oven. There are two conservatories which enjoy the sun all day and fabulous views across the valley to the countryside beyond. Furthermore, there is a large, private garden extending to nearly 3/4 acre, with plenty of room and decking area for outdoor dining, lazing in the sun, games etc. Plenty of on-site parking and turning area. Majority of living/sleeping areas on 1st floor. Master - super king bed, countryside views. 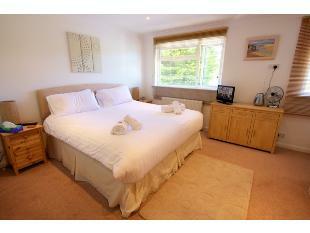 Bed 2 - Double bed, single bed, countryside views. 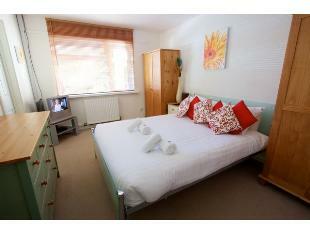 Bed 3 - Double bed, single bed, garden views. 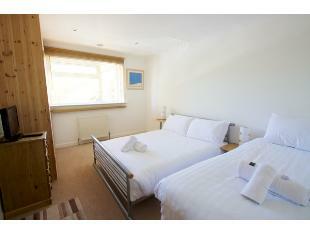 Bed 4 - Triple Bunks, garden views conservatory off. Bed 5 - king size bed, ground floor. 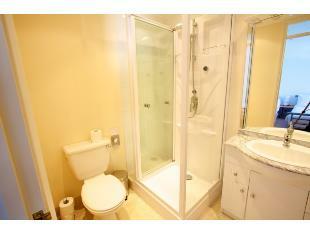 En-suites to master/bed - shower cubicle, jets and overhead power shower, wc, basin, fully marble tiled. 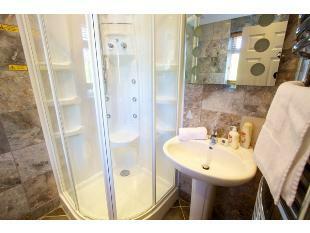 En-suites to beds 2/3/5 - built in shower cubicle, wc, basin. 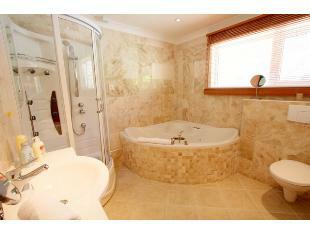 Family bath - corner spa bath, shower attachment, sep shower cubicle, wc, basin. Oven and halogen hob (5 rings). Double sink. Fridge/freezer. Water cooler machine. Dishwasher. Microwave. Coffee Maker. 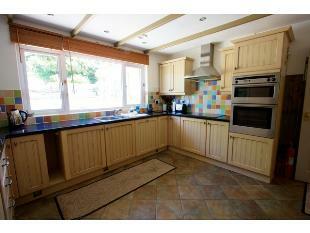 All usual kitchen equipment - toaster, kettle, crockery, cutlery, glasses, cookery books etc. Slate floor. TV. Table and chairs. American fridge/freezer with ice maker and cold water on tap. Large washing machine. American tumble dryer. Slate floor. Door to rear garden. 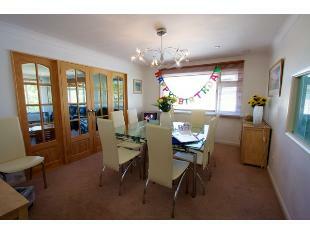 Beautiful, large living room/dining room which can be separated by double doors. 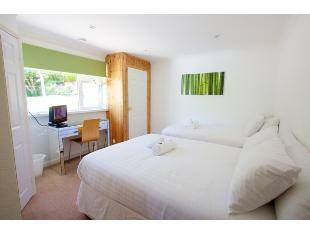 Excellent views across the valley to the countryside beyond from large picture windows. Brown, leather, electric reclining sofas; LCD TV system, dining table/chairs etc. 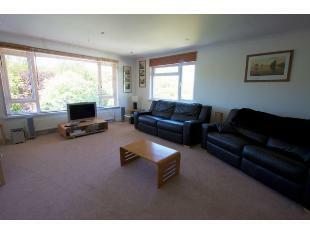 Large, ground floor lounge / diner equipped with own galley kitchen (small fridge, cooker sink), sofas, table/chairs, TV, DVD etc. House is split level with majority of living and sleeping areas on the 1st floor.